Bathroom trends for 2018 are keeping bathrooms fresh and advancing into some high-tech décor. With adding more functionality and more comfort, this year’s bathroom décor trends are on point. Learn how to bring your bathroom up to date with some of these trends. 1. Smaller but more space efficient bathrooms. Many of us have bathrooms that may be smaller than we’d like them to be. But with space efficacy, you can keep them from feeling small and cramped. You can save a lot of space with uniquely designed showers, tubs, and toilets. A floating vanity, for example, leaves room undeath and creates a more spacious environment. 2. Bathrooms are going high-tech. Between Bluetooth shower speakers and heated toilet seats, bathrooms are going high-tech just like the rest of the world. You can now purchase toilets with features like automatic lid openers and built-in deodorizers. While you’re getting ready in the morning, why not watch some TV with a screen installed int your vanity? The bathroom tech options can make any bathroom a luxurious one. You know that feeling when you get out of the bath or shower and the tile is freezing? Well, technology has solved that problem too with heath bathroom tiles. Why stop at a heated toilet seat? Make your entire bathroom nice and cozy with heated amenities. 4. Neutral styles are all the rage. Neutral décor is increasing in popularity. With neutral and natural feeling décor taking over, the organic feeling of minimally decorated rooms is becoming common. It’s like bringing the outdoors indoor with neutrals, plants, and other nature-inspired and organic feeling decoration. White, creams, browns, and other natural feeling colors have been on trend for 2018 bathrooms. 5. Unique tile shapes are taking over. Gone are the days of square tiles. Make your bathroom floors, showers, and backsplashes more interesting with a more unique option. Hexagon, arabesque, diamond, and chevron patterns are all becoming popular alternatives to the square tile. People are even getting creative with their square tile layout, creating unique designs or pixeled pictures. Mixing and matching different tiles shapes and sizes will also add some variety and character to your style. 6. Cocktail tables are not just for cocktails. Wouldn’t it be handy to have a small portable table in your bathroom? We thought so too. A little cocktail table can come in handy when you’re in the tub and you want a drink and a book nearby. Or when you’re getting ready in the morning and you need a little extra vanity space. And if it’s taking up too much space, you can fold it up and put it away. 7. Gold is making a comeback. It seemed like gold had run its course and silver had taken over for a while there. But the warm-toned metal is back. Gold and rose gold are a warmer hardware option for light fixtures, mirrors, showers, and more. This classic metal adds a feeling of luxury. 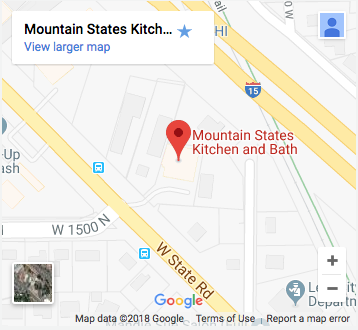 If you are feeling like your bathroom needs a little remodeling to stay up to date with the hottest trends, contact us at Mountain States Kitchen and Bath.